Retirement is a momentous occasion that definitely deserves a special celebration. If you're hosting a retirement party for a co-worker, friend, or family member, the invitation you choose will set the tone of the event. Select a style that is serious and elegant, or a silly one that's sure to get a laugh - whichever is appropriate for the type of party you plan to host. If you're planning to mail or hand-deliver invitations, consider using one of the free printables provided here. Click either of the images to launch a printable document that you can easily customize by clicking in the text area and typing in your changes. When you're ready to print, click the printer icon, and select the diskette to save it for future use. 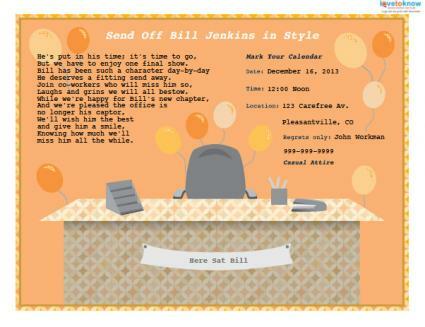 Click to download a funny retirement party invitation. 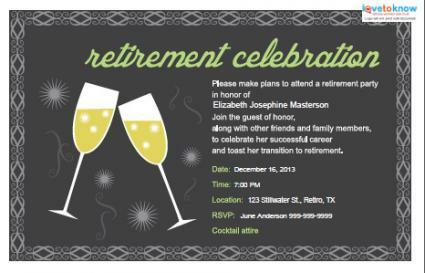 There are many additional invitation options for retirement parties, including other print styles and e-vites. If one of the printable invitations above doesn't meet your needs, check out the following resources. Zazzle has an excellent selection of invitations that range from cute scenes that show retirement activities like lounging on the beach and fishing to elegant black and gold styles perfect for formal occasions. The cost is about $2 per invitation, and the messages can be customized. Orders ship within 24 hours and Zazzle has a 100% satisfaction guarantee. Invitation Consultants also has a nice selection of retirement invitations in a variety of styles. Most of the invitations have an elegant appearance, although there are a few styles that are less serious, including ones with golf and boating theme designs. You can order packs of 10 for around $30 and packs of 100 for around $130 for most designs. Each style can be personalized. Most orders print and ship within two to four business days. Party City is another great source for your invitations. Visit your local Party City store if you'd like to see the invitations in person before you make a purchase. They have a few styles designed for retirement that have designs printed on the front and blank lines inside for you to fill in details. Eight-packs cost between $4 and $9, depending on the size you choose. Party City also has a few elegant card stock invitations that can be custom printed and cost between $1 and $3 each. These styles can be ordered from the store's website. No matter which invitation you choose, follow a few retirement party planning tips and the event is sure to be a hit with the guest of honor and everyone who attends!